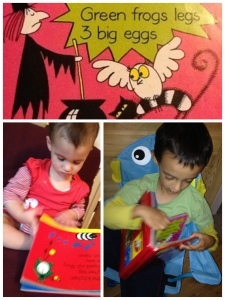 Finally a series which entertains both Bryn & Freya – Meg and Mog. I was glad when Freya dragged Meg & Mog (a compendium of 4 stories) out of the book box the other morning as its a series I really like. It also made a nice change from the tactile books she enjoys but which have no story. 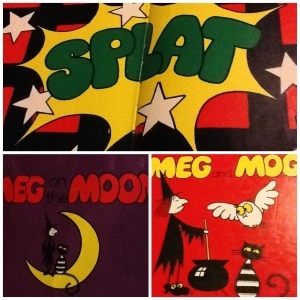 Meg the witch, her cat Mog and Owl often start the story with something as simple as a trip to the seaside but once Meg casts a spell it leads them down an unexpected path. The bright bold colours & simple illustrations with stories short enough to match her attention span are key to Freya’s enjoyment. Bryn meanwhile enjoys them for their humour as the spells inevitably go wrong or have unexpected consequences. A great example of amazing storytelling with few words and unique illustrations about an endearing little family you can’t help but warm to. This entry was posted in Uncategorized and tagged bryn, Freya on August 31, 2012 by damyanti. How brilliant to see that Jan Pienkowsky’s fabulous illustrations are still casting their spell, and to see Bryn and Freya so captivated!